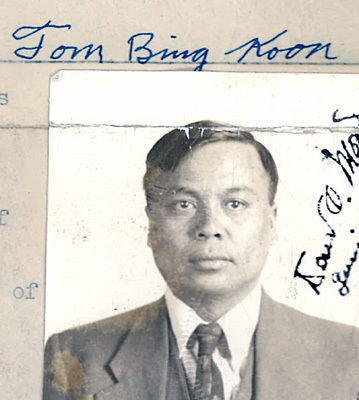 “Tom Chon How and Tom Bing Koon affidavit photos,” 1939, Chinese Exclusion Act case files, RG 85, National Archives-Seattle, Tom Chon How case file, Seattle Box 799, file 7030/13041. Tom Chon How arrived at the Port of Seattle on 20 November 1939. She was admitted almost a year and a half later on 10 May 1941. Her file was over 70 pages long. 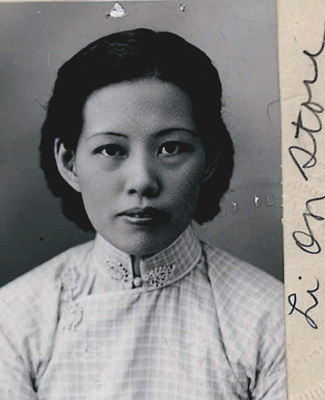 After her father, Tom Ngon Sing, died in China she decided to come to the U.S. to live with her brother, Tom Bing Koon, in San Diego, California. Since she was the daughter of a U.S. native-born citizen she would or should have been considered a citizen. She was born on 20 December 1907 in Seung Sing, Tin Hong, Toy San, China. Her step-mother paid for her passage over. Tom Chon How was a school teacher. In 1938 her brother, Tom Bing Koon, of San Diego, California, swore in an affidavit that his father, Tom Ngon Sing, was a native born citizen. His citizenship was proved by record #9544 on file at the U.S. District Court of Northern California. Tom Bing Koon was 42 years old in 1939 and came to the United States at age thirteen. He swore that his sister, Tom Chon How, the daughter of Tom Ngon Sing, was coming to the United States to live with him. During Tom Chon How’s arrival testimony she was asked about her extended family in the U.S. and in China, in particular her nephew Hom (Tom) Tung Hing. She claimed that he died in 1931 on his way back to China. The examiner said that the alleged Hom (Tom) Tung Hing was admitted at Seattle in December 1939. A warrant of arrest was issued for Tom Tung Hing. He was found in Tucson, Arizona and he gave a statement. He claimed he was the true Tom Tung Hing and Tom Chon How was lying; that the information she gave the investigators was false. Immigration officials began an investigation in Minneapolis (the nephew’s father was living in Minneapolis at some point) and San Diego. There were huge and small discrepancies in Tom Chon How’s and her brother’s testimony in the description of their native village. The examiner noted that Tom Bing Koon had not been in China for more than twenty-three year. He had never met his nephew so he could not identify him. Tom Chon How was interviewed again in March 1940. Most of the questioning centered on her home village—how many rows of houses, how many houses in each row, who lived where, and details about the neighbors. “Tom Chon How letter,” 1940, Chinese Exclusion Act case files, RG 85, National Archives-Seattle, Tom Chon How case file, Seattle Box 799, file 7030/13041. After reading the transcription of the deportation proceedings for Hom Tung Hing, Immigration authorities decided to question Tom Chon How again. By July 1940, a decision had not been reached as to admit or deport her. Her case hinged on Hom Tung Hing’s case. A month later the F.B.I. was comparing the handwriting samples of the Hom Ting Hing who left the U.S. in 1931 with the Hom Ting Hing who was admitted to the U.S. in 1939. Which one was a forgery? The next day she was transferred to Seattle Marine Hospital for examination and treatment. She was suffering from severe nausea. Immigration decided to interview Yip Shee, the wife of Tom Bing Koon, Tom Chon How’s brother. Yip Shee and Tom Bing Koon married in 1916 and came to the U. S. in 1919. In 1941 Immigration officials interviewed her about her husband’s home village; over twenty years after they left the country. There were significant discrepancies about the village in Yip Shee’s testimony but she gave some helpful information. She remembered that Tom Chon How seriously cut the index finger of her right hand when she was about ten years old. Yip Shee bandaged it for her. The inspectors checked Tom Chon How’s hand. She had a scar that matched Yip Shee’s description. They now believed Tom Chon How was the person she claimed to be. Inspector J. P. Sanderson, chairman of the inquiry, wrote in his three-page summary of the case that Tom Tung Hing’s arrest warrant was canceled. Although Sanderson did not agree with the determination of Tom Tung Hing’s admittance in 1939, Tom Tung Hing was not deported. Tom Chon How’s case was delayed considerably because she consistently maintained that Tom Tung Hing died in 1931. The immigration inspectors agreed that if the information on Tom Tung Hing was ignored, the applicant should be admitted. Tom Chon How was admitted at the Port of Seattle on 10 May 1941.